What exactly is an Australian visa? This is understandable. Perfectly! Even the dictionary and Wikipedia definitions indicate that a visa is a mark in a passport, and the word “visa” comes from the latin and indicates it’s something you can look at. So naturally, everyone assumes it is an actual “thing”. Australia views visas differently. A visa is permission to enter Australia. You may only enter Australia if you are an Australian Citizen, or if you have a visa. No visa = no entry. Even New Zealand Citizens need a visa to enter Australia, although they are issued one (Subclass 444) automatically when they enter the country. There are no visa-free countries as far as Australia is concerned. A Subclass 600 Tourist Visa will allow the applicant to enter Australia and to do tourist-things up until the date it expires. Conditions imposed will include MUST NOT WORK, and MAXIMUM 3 MONTHS STUDY ALLOWED. A Subclass 300 Prospective Marriage Visa will require that the applicant enter Australia by a particular date, and require the applicant to marry the sponsor within 9 months of the grant, and will allow the applicant to work. 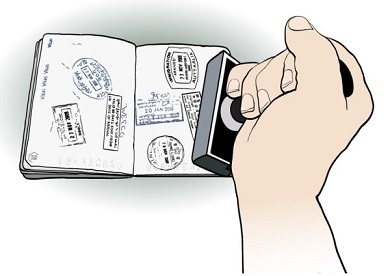 Subclass 309 and Subclass 820 Partner Visas will allow the applicant to work too. Again, the visa is NOT a sticker or a stamp in the passport. It is most definitely LINKED to the passport, because the details of that visa (ie. that permission to enter Australia) will be electronically linked to the passport. The immigration people at the airports both entering and leaving Australia or Manila in the Philippines will scan your passport and will see the details of your visa. That’s how they know if you have a visa or not. What if you change your passport? If you change your passport, MUST let the Department of Immigration and Border Protection (DIBP) know, for the reasons above. If you, say, leave Australia on a new passport and then try to get back in, you won’t get on the plane at Manila because they will not be able to see the existence of your visa. They will scan your passport, and they will see nothing. There are no automatic updates. How? Form 929 from the Department. You can just Google it and you’ll have it in minutes. Fill it in, sign it, and send to the nearest office of the DIBP along with a certified copy of your new passport. And do it in plenty of time. You should clarify it with VEVO to ensure it was properly updated before flying and getting yourself stuck somewhere. What do you get from DIBP or the Embassy? You get a Visa Grant Notice. This is a pdf file that says that you have a visa, and has the important conditions on it. Make sure you read it and understand it, as you will have no comeback at all if you get something wrong because you didn’t. Do you get a sticker? Not anymore. In years gone by, we used to have to courier passports in and wait for them to return with stickers. Do I miss doing that? NOT AT ALL! It was annoying! It was also a bit of a dinosaur, as there are no non-electronic airports in Philippines or in Australia. Passport gets scanned. No one looks for stickers or stamps. Do you need to show anything at the airport or at the CFO? Yes, at the CFO you need to show them your visa grant notice. No, you don’t need to show them a sticker. They already know that Australia doesn’t issue them anymore, so don’t stress over that. At the airport? We recommend bringing the notice along to show the guard at the door if he asks, but the actual details are all in the computers and a scan of your passport will show them all they need to know.